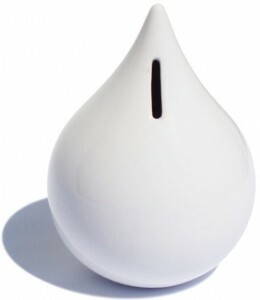 Take the savings plunge with Drop Bank money box! I’m thinking a surefire way to encourage children to save some pocket money is to let them know they can break something when the last coin is deposited and the money box is full. 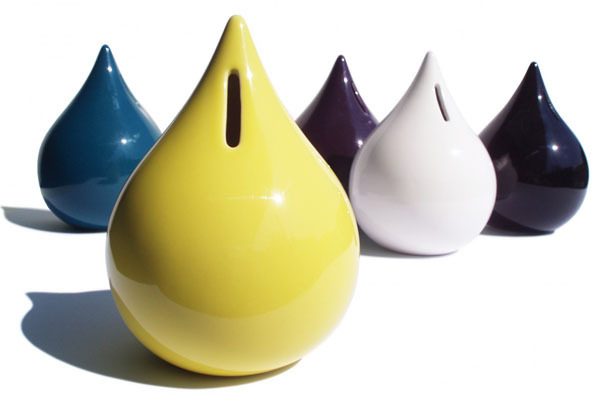 The Drop Bank by Rita Botelho is drop dead gorgeous. Made from glazed ceramic, you wouldn’t know it was a money box to look at it perched upon a shelf. The only thing that gives it away, of course, is the money slot. There’s no easy plug enabling kids to dip into their savings – the only way to get at the coins is to drop it and with the heavy force of gravity, let me assure you the plunge will be quick! It’s a bittersweet ending, on one hand you’ve lost your fabulous Drop Bank, yet on the other you’ve released your savings! Perhaps the secret is to save enough to buy a new one! I’m still not sure whether encouraging children to deliberately break something is really the correct thing to be doing as a responsible parent. But since this particular money box is designed to do exactly that, then it can only be a good thing, right? You can get one in yellow, blue, white or black from The Vitrine for US$50. International delivery is available.